When you are in a rush and you want something comforting to eat, there is nothing like a noodle dish to hit the spot. Pack it full of vegetables and top it with some salmon and you have yourself a super healthy Ginger and Soy Salmon Noodles. Noodles always hold a special place in my heart, as the remind me of my student days. Instant noodles were a staple in my diet back then, not really because I was poor but because I would rather spend my money on other student activities *ahem – beer*. Although my money is spent a *little* better now, noodles are still eaten often in our house, we just make them more exciting and healthier than we used to. 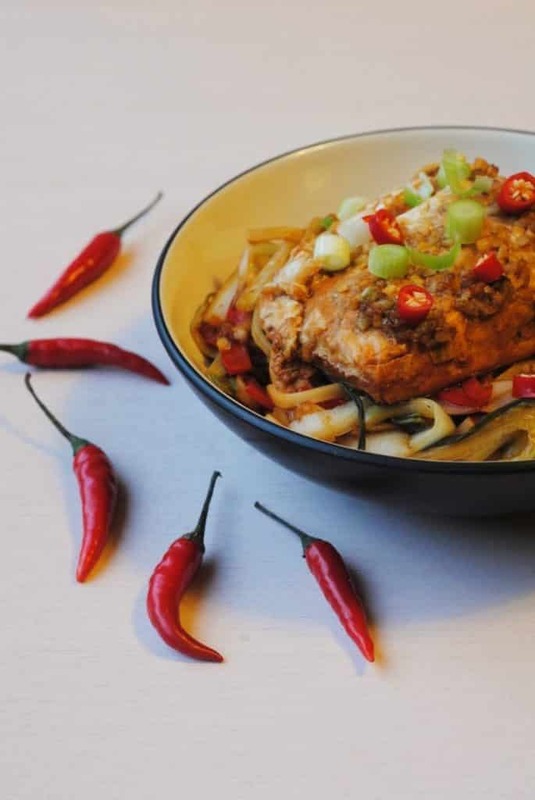 As well as packing them full of vegetables and making a delicious sauce to bring everything together, we usually top our noodles with salmon because it’s so easy to cook. Noodles are so easy to cook, so you want something easy to go with that, right? 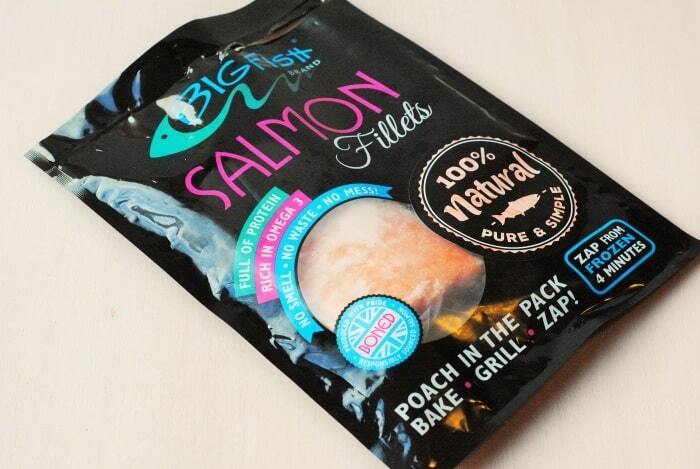 Salmon doesn’t come easier than these salmon fillets from Big Fish Brand. You can keep them in the freezer and then just poach it straight in the pack, or oven bake it, grill it or even zap it in the microwave. If you don’t feel like making your own sauce or seasoning for the salmon, then Big Fish Brand have got you covered, as they do lots of different flavoured salmons. Some of my favourites are lemon and pepper, peri peri, BBQ and sticky maple glaze. It’s not just salmon fillets they do though, they sell fish cakes too. Take a look at their website for stockists or to order online. This is premium seafood and it is responsibly sourced Atlantic salmon. 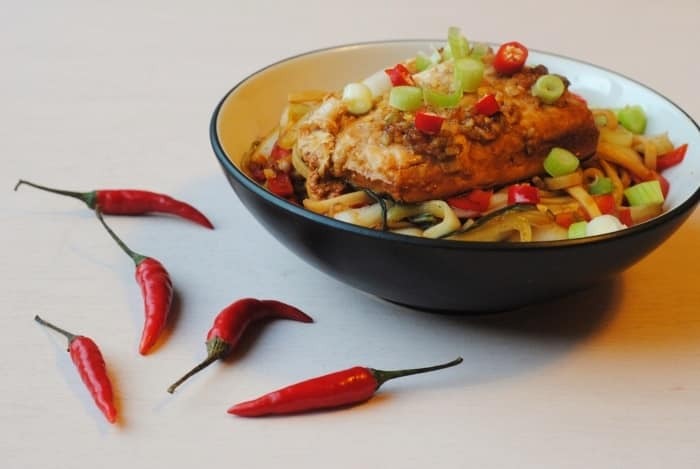 We are trying to put a lot of ginger in our meals at the moment, which is easy as we love Asian food, because I am convinced that it is what stops me from getting ill. I have only been properly ill with a cold once in 5 years and I eat a ton of ginger (and lots of other healthy things of course), so there has to be some kind of correlation, right? If you cooked this salmon in the microwave and then chopped it up and added it to the cooked noodles, then this recipe could be ready in just 10 minutes, making it even easier. Note to everyone, don’t touch red chillies and then touch your eye. I have made that mistake way took many times, yet I still keep doing it. Will I ever learn? Maybe. When you are in a rush and you want something comforting to eat, there is nothing like a noodle dish to hit the spot. Spring onions and red chilli for serving. 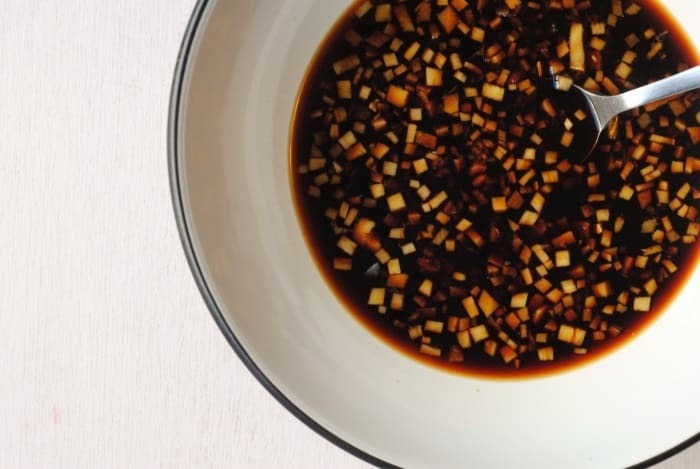 Mix together the soy sauce, rice vinegar, lime ginger, garlic and ginger and stir well. 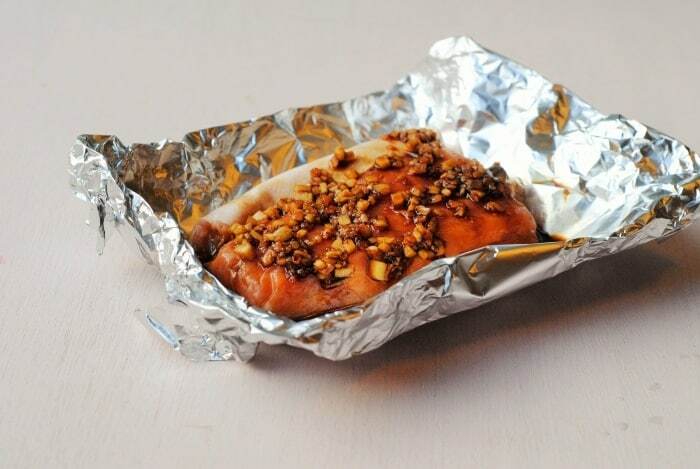 Place the salmon on some foil and pour half of the soy mixture on top and wrap up in to a parcel. Cook in the oven for 35 minutes. 10 minutes before the salmon is ready, add the noodles to a pan of boiling water for 5 minutes and then add the pak choi and cook for a further 3 minutes. Drain the noodles and put back in the pan and on a gentle heat. Add the rest of the sauce and stir for one minute to head the sauce through. Add the noodles to a bowl and put the salmon on top and scatter over the spring onion and red chilli. You can find me on Facebook at Hungry Healthy Happy, on Instagram at@hungryhealthyhappy, on Twitter at @HHH_Dannii or on Pinterest at hhhdannii or you can subscribe via email. When is red pepper added? 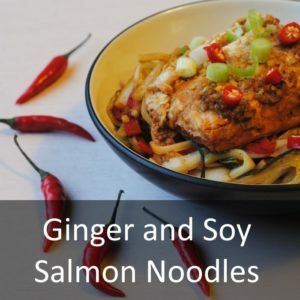 I love salmon cooked with ginger and soy – and noodles are great as you can pack lots and lots of vegetables in with them. Fantastic weeknight supper dish! This looks so tasty! Great way to flavour salmon, and healthy too! Im absolutely loving noodles right now! Soba noodles, rice noodles (noodles with everything!) this looks delicious! You have 2 of my favorite asian flavors that I often cook with – soy and ginger! Hubby loves salmon so I am pinning this to make for him later! Thanks for the healthy and delicious inspiration as always!